Tonight I made dog pumpkins using the free pumpkin stencils at Better Homes and Gardens. They have a a number of popular breeds with downloadable stencils that are easy to follow. I used the Labrador stencil, which looks the most like Emily. Unfortunately, there isn't a Border Collie stencil, which would have been perfect for Cara, so I used the German Shepherd one (I just shorted the ears a bit). My mother made a Chihuahua pumpkin so I will also be posting pictures of her Chihuahua pumpkin soon. 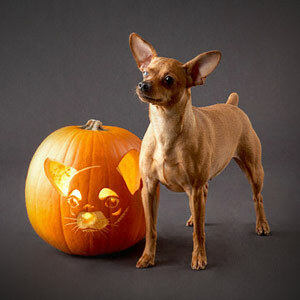 Try making your own dog pumpkins! They currently have stencils for: German Shepherd, Beagle, Boxer, Bulldog, Chihuahua, Dachshund, Golden Retriever, Labrador, Poodle, Pug, Scottish Terrier, and Yorkshire Terrier.